Noise! It’s the mot du jour after Westminster Council pulled the plug on Bruce Springsteen the other night, leaving him to continue without amplification because the concert’s licence allows amplified music until 10:30pm only. Now, I can see that Brucie has brought pleasure to millions of elderly deaf people around the world, but should he have been allowed to disturb the slumber of others (not that anyone goes to bed at that time around here)? After Twitter turned red with outrage, the BBC ran a spot-check on complaints and found that (and this is separate to professional concerts like Springsteen’s), people across the country were sick of having every holiday and festival turned into an excuse for nights of bad amplified rock sponsored by local councils. Last Saturday night we got a new town square. 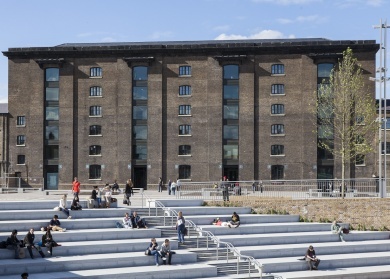 At the moment, Granary Square is little more than a windswept concrete plain full of fountain jets, but to launch it we had an incredibly amplified concert. There was hardly anyone there because of course it was howling with rain, but never mind, I was able to enjoy it until midnight in my kitchen, lounge and bedroom, and I was pretty far away. I love live music, but the only reason for amplifying it so much is to cram in lots more punters. The first time I went to the theatre in Los Angeles, I found myself sitting in some kind of agoraphobia-inducing football-pitch-sized stadium, which was hilariously because it was Ibsen. The cast wore throat mikes so they could be heard thirty miles away. In London, theatres are mostly like town-houses, narrow and tall so that sight lines remain good and voices can travel upwards. Sit in the Gods and you can hear just as well as in the stalls, without amplification. But hey, guess what every actor now wears in these intimate venues? Yes, you can see an ‘Importance of Being Ernest’ in which Lady Bracknell has a mic taped to her forehead. Opposite my kitchen window are two classical concert halls which manage nightly performances without amplification, and host ‘silent discos’ wherein everyone is electronically connected. I regularly do readings where I’m given a mic, but I tend not to use them. They’re more trouble than they’re worth, thanks to the fact that the sound engineer is usually the lady who runs the children’s library. I love most forms of modern music from rap to hard house but one of the most penetrating sounds I ever heard was from the Michael Nyman Band, busking in the foyer of the Royal Festival Hall. They were playing raucously without amplification. I’d always considered modern ‘classical’ music either too abstract and cerebral for my tastes, but here was a disciplined group sweating, sawing and hammering out a raw sound capable of stopping passers-by dead in their tracks. What a great challenge it would be to tell performers that their next gig is limited in size and unamplified. Who knows what they’d come up with? When they used to have concerts at the old Wembley Stadium; people 9 miles away could feel the vibrations! Apparently, it was a bit of a mystery for a while; like Concord, and the sonic boom of the seventies. Went to see Paloma Faith at Somerset House last night – I’ve done lots of concerts, often at the front (because I’m short), and have never had a problem, but the sound levels were so bad we were driven back down the courtyard. They seem to have confused “noise” and “sound”. The backing vocalists and guitar were inaudible, it was far too bass heavy although thankfully Paloma was nice and clear, but it was physically unpleasant being at the front (or anything near it) because of the vibrations. Instead of “let me see your hands!” it was more “let me see your brain dribble out through your ears”. Pretty venue though. Just about everything that’s done on a stage now is over-processed and faked. Stage productions once were as “lifelike” as the professional theater could make them, but you still could see the boards – if you sat up high, hear the scene changes behind the curtains, and sometimes you had to strain a bit to hear. It added to the magic and the charm. What would next appear when the curtain parted? I was most fortunate when quite young to get to see a number of first run original cast, original production Broadway shows, with my parents. The magic was there in “Oklahoma” despite the sound of the square dancers’ feet on the boards, not on the plain, and you could see people sweat, and you could feel how the singers “belted” a song out over the audience. Now a days? For me, you might as well stay at home, watch it on a really big television with a control, and not have to wear earplugs to protect your hearing and sanity. It is amazing how much is lost with all the gains of high tech. Churches all have microphones these days and speakers expect to be able to chat and still be heard. As a teacher I was taught to project my voice across a room and (unfortunately) did just that last week. What irks me is the person with a hearing problem and sitting three quarters back who complains about the difficulty hearing. I wonder how many were rock fans in their youth? I’ll tell you which noise annoys: these bloody adverts with a quality record (eg Pixies, Buzzcocks) covered by some wailing harpy with an acoustic guitar, in order to sell tissues or insurance, or pretend that a lady’s monthly visitor can actually be a happy event.